In today’s post: Nine wedding photography tips so you can take great wedding photos even if you’re not a pro! Recently, I had the opportunity to take wedding photos for a close friend’s daughter. Now, I like photography and I’ve tried to learn to take pictures I’m happy with, but I don’t consider myself a professional photographer, so I was nervous. As in, really quite nervous. So my friend and I worked together to figure out what we could do to make sure the photoshoot would go as well as possible. Today I’m sharing 9 tips for taking great wedding photos, even if you’re not a pro, along with some of my favorite shots from the wedding. Before I share these tips, I do need to say one thing: the best way to get great wedding photos when you’re not a pro is to hire a professional. Pro photographers spend years learning their craft, and a few tips off the internet aren’t going to give you comparable results. And if any day is worth hiring a photographer for, it’s your wedding. That being said, I also understand that there are plenty of reasons a non-professional may end up taking some or all of the wedding photos: perhaps it’s only feasible to hire a photographer for part of the event and you’re asked to take photos during other portions, perhaps you’re building up your photography skills and want to practice as a “second shooter”, perhaps circumstances prohibit hiring a professional, etc. 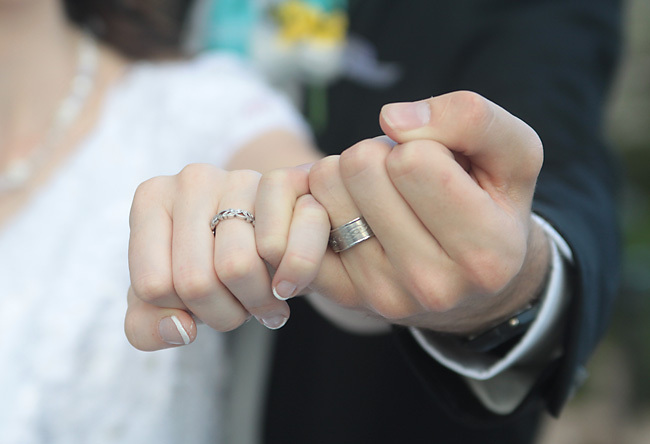 There are things you can do to help ensure the best wedding photos possible, even when you aren’t a professional photographer, and that’s what these wedding photography tips are for. Wedding photography tip #2: Take pictures in advance (if possible). The wedding I was photographing was at 11 in the morning on a very bright summer’s day, meaning the photo options outside would be limited since I didn’t want the couple squinting into the sun. So I asked them if we could take some photos of the two of them the night before the wedding, outside the temple they’d be getting married in. This turned out to be a fantastic idea for two reasons. First, since we were taking photos before the event, our timeline was relaxed and we didn’t have a huge audience. This went a long way toward making both me and the couple more relaxed, which meant we got better photos. We had plenty of time, which meant more photos to choose from. And finally, the evening light meant we were able to get all sorts of photos that just wouldn’t have looked good in the full midday sun. When they look at these pictures years from now, they won’t care that they were taken the night before their wedding instead of a few minutes after. Wedding photography tip #3: Bring inspiration photos for reference. 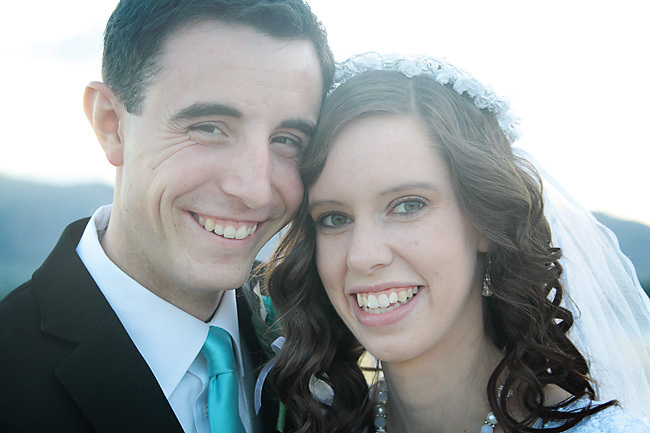 Ask the bride and groom to gather example photos that they love. Tell them to grab photos they like off the internet and drop them onto a blank document, then print them out to show you. You can gather your own inspiration as well: a variety of poses, details you want to remember to capture, etc. Print them all out and bring the pages with you on the photoshoot. It’s easy to forget your plan when you’re in the middle of taking pictures, and it’s hard to remember a bunch of different poses when you aren’t used to photographing weddings, so a couple pages of inspiration photos will go a long way toward helping you get more variety and better photos. I’d never have thought of taking the photo below if it weren’t for an inspiration photo the bride brought for me to look at. Wedding photography tip #4: Get a list of must-have group photos. Ask the bride and groom to make a list of each different group they want photographed. For example: bride&groom with both sets of parents, bride&groom with the bride’s parents, bride only with the bride’s parent, bride with her sisters, groom with his dad and grandpa, etc. If there’s much family involved, chances are you’ll be taking quite a few group photos, and you don’t want to miss any that the couple later wish they have. The couple might think they’ll remember all the photos they want on the day of the wedding, but chances are they’ll be a bit distracted during the event, so a list of all the must-have photos is really a must-have. Wedding photography tip #5: Have a helper. Whether you’re photographing just the bride and groom or the entire wedding party, a helper can be a lifesaver. Give your helper the must-have photo list and ask her to keep track of which ones you’ve taken and which ones you still need to do. Ask her to call out who’s up next and help arrange each group so you can stay in one spot taking the photos. Also have her make sure the bride’s dress/train/hair/etc. all look good for each shot. She can help carry any gear, including a folding step-stool, which will help you get photos from different angles. Wedding photography tip #6: Take lots of photos. When you’re not a professional photographer, your best chance of getting great photos is taking a lot of them. For each pose, take at least 15 shots, changing something each time you press the shutter button. Take some closeups; ask the couple to look at you, then at each other, then to kiss, then to rest his cheek on her head, then to laugh, etc. Then zoom out for some half body shots, then step back for a full body shot. Move around and take photos from different angles, from above or below or to the side, focusing sometimes on the bride, sometimes on the groom, etc. You can get a variety of completely different photos from the same pose (see photos below). You can even stop taking photos for a few minutes and let them talk to each other, then snap a few candids. Just keep changing small things about the photo and keep snapping that shutter button. Some of the photos will turn out better than others; you can delete the bad ones and keep the good ones. 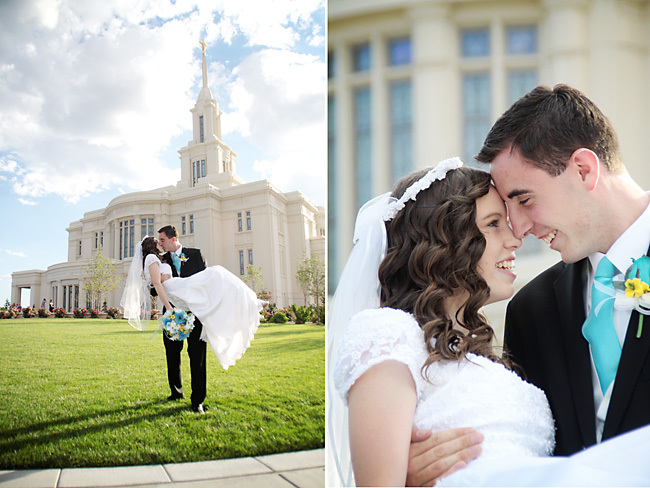 Wedding photography tip #7: Try to take most of the photos outside. It’s generally harder to take photos inside when you’re a beginning photographer because you need lots of light to get good photos with basic camera equipment. When you must take pictures inside, avoid your on-camera flash at all costs–it will cast ugly shadows and give people alien eyes. Instead, turn on all the lights and open any windows and doors to get as much light in the room as possible. If the venue is too dark to take photos without using your flash, take them outside instead. If your indoor photos end up looking yellow, learn how to easily color correct them. 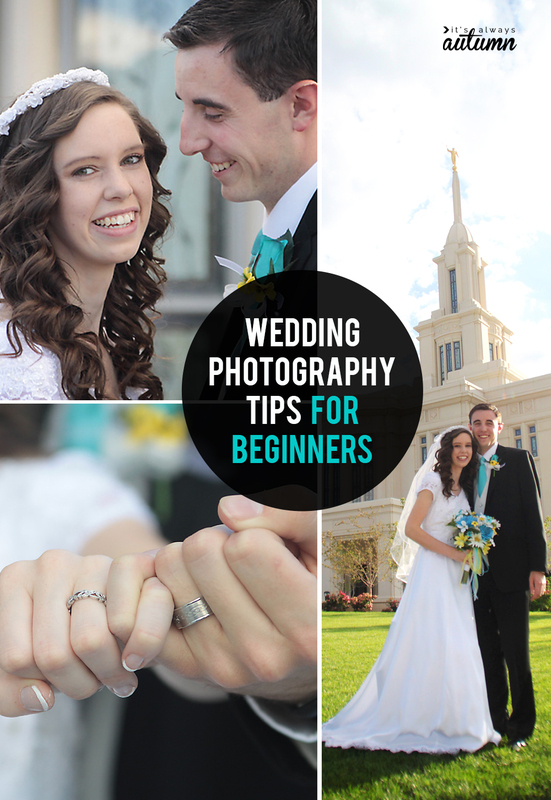 Wedding photography tip #8: Learn how to brighten your photos. 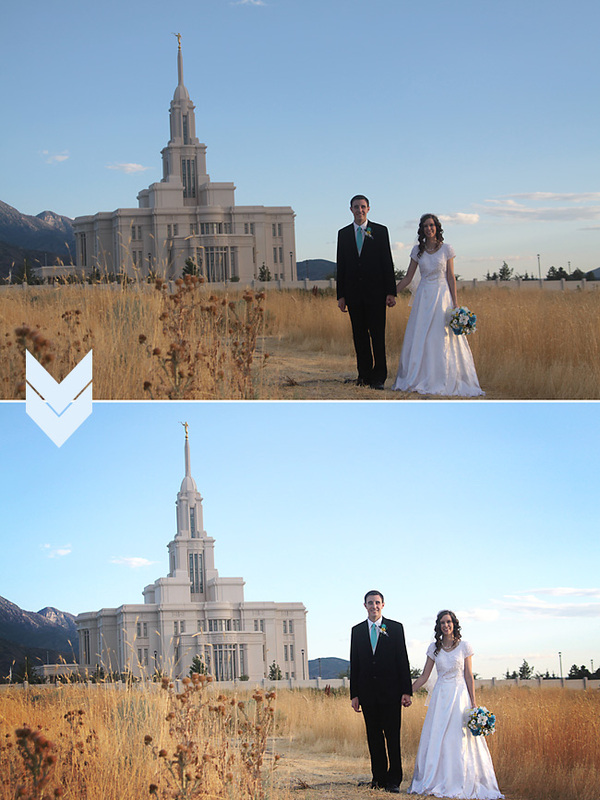 If you’re going to be using auto for most of your photos, plan on doing some brightening after the fact. Many photos taken on auto are just a little dark, which can leave them looking drab when printed. It’s actually quite easy to brighten and color boost photos, and it can make a dramatic difference in the final look of the picture. If a photo you really hoped would turn out just didn’t, try switching it to black and white to see if that helps. Wedding photography tip #9: Finally, relax. Even if you’re nervous, pretend you’re not once you start taking photos. If you seem stressed, they couple will feel stressed, and you’ll be able to see that in the pictures. Talk to them, ask them about their plans, tell them how gorgeous they look, how happy you are for them, etc. Help them feel relaxed so their excitement will show in the photos. That way, even if your pictures aren’t perfect, they’ll still be treasured. 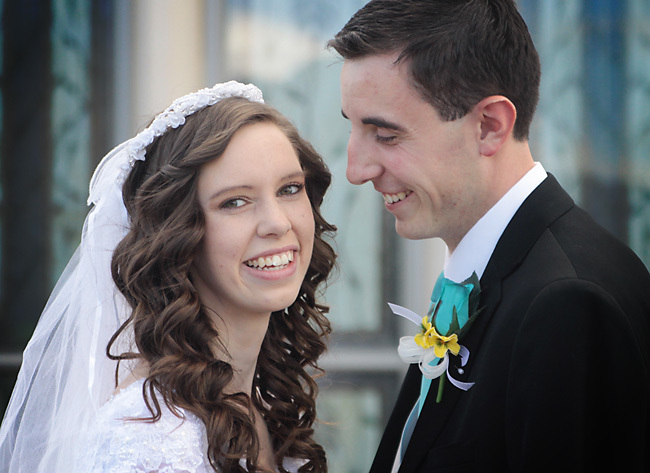 Very lovely photos of a very lovely Bride and Groom! 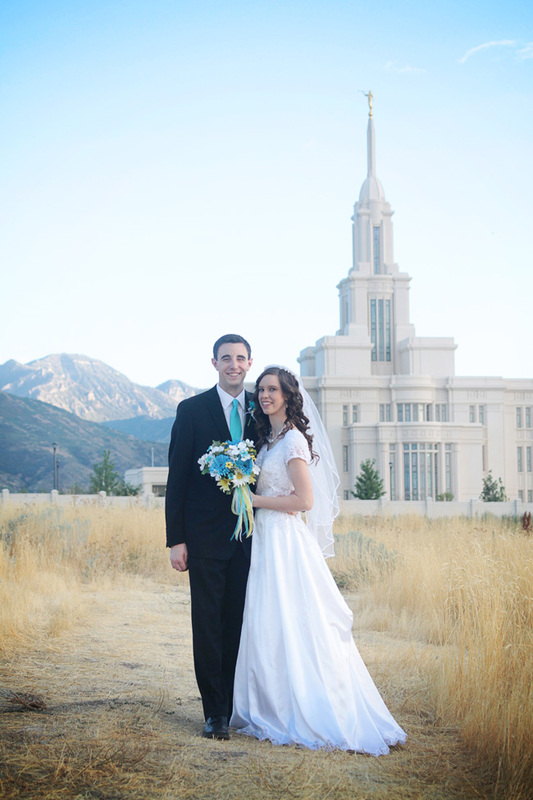 I love the picture of the couple with the temple and the mountains in the background. Thanks for the tips! Great job! What a wonderful, straightforward, inspiring and understanding article. Full of great ideas. Your shots from your non-professional wedding shoot are fabulous. The couple, and you, must be thrilled. Thank you so much for all the tips. You’re awesome! I love your photo tips and wish my non-professional shots looked half as good as yours. Thanks for the blog post! Great pictures Autumn, they were fun to see. I love the one of the rings. Tell Denise hi for me. Or hire a pro. A wedding day isn’t a day to “experiment with” as a non professional photographer. Those are the photos that a couple keeps and looks back on for the rest of their lives, and as a friend if you don’t do a good job you could hurt your friendship. That’s a pressure you wouldn’t take on. Professionals are cheaper than ever, and most accept payment plans. If you want practice go work as an assistant first. I totally agree! This was my daughter’s wedding, and I knew full well the capabilities of the photographer before we asked — I wouldn’t have asked just any friend or aspiring photographer. (And I’ll add that we were very pleased with these and others we received.) However, many of these tips and tricks are great even if you hire the most experienced photographer. 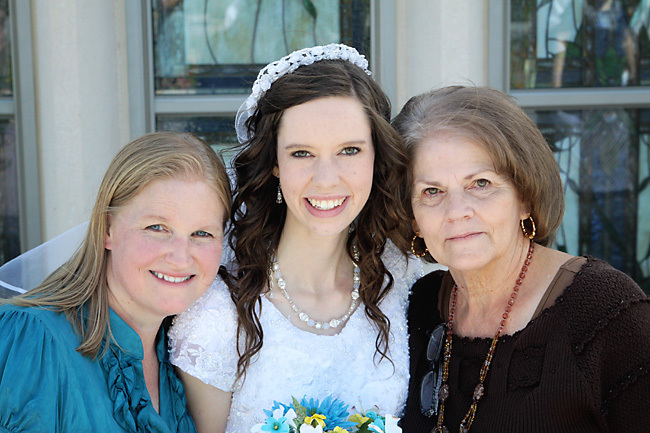 I hired a professional for mine, and although he did a great job, I didn’t get the picture of me and my sisters I had hoped for because I forgot on the actual day. Giving a list to any photographer is a great idea! That’s true that professionals have more experience when it comes right down to it. There are sometimes extenuating circumstances that make that impossible, though. Taking pictures in advance is a good idea. I’ve been to weddings where it’s too bright to have good pictures at the event itself. It’s nice to be prepared, especially since it might be raining or something. Hey Autumn, awesome blog post! Took away so much from this please put more content like this out! This is a great website for beginners as it guided well each and every step are useful in learning and can become professional in capturing photos by following all the steps well. Checking the location in advance will provide the idea about the location that what would be the current scenario of that location.